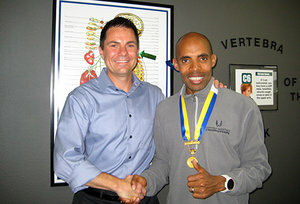 When Meb Keflezighi crossed the finish line at the 2014 Boston Marathon, becoming the first American man to win the prestigious event in 21 years, he exemplified more than just "Boston Strong" one year after the senseless terrorist bombings; he embodied "chiropractic strong," a testament to the work of his doctor of chiropractic, San Diego-based Devin Young, DC. Speaking about Dr. Young following his victory, Meb said: "As an elite athlete, recovery and therapy is essential to staying healthy and competitive. I have seen Dr. Devin Young as my chiropractor for years and see him twice a week during training. His care has been especially helpful leading up to and including the Boston Marathon. I have been able to recover faster and easier after races. He is very knowledgeable and professional, and I am very thankful to have him locally to keep me healthy." In this exclusive Q&A with Dr. Young, learn how he became involved with Meb, how he helps Meb prepare for elite competitive events such as the Boston Marathon – and how chiropractic care can help you, whether you're a weekend runner or a professional. Q: Dr. Young, when and under what circumstances did you become Meb Keflezighi's chiropractor? A: I was introduced to Meb when I was living in Mammoth Lakes, Calif., where USATF [USA Track & Field] had an elite training group. At the time, I wasn't even a chiropractor. When I made the decision to go to chiropractic school, I obviously had to move. I went to Life West [in Hayward, Calif.], which is still reasonably close to Mammoth, so I would go back to Mammoth and visit friends frequently. During one of my visits, I ran into Meb and we got to talking. He asked me if I wouldn't mind checking a couple things on him. That was in 2010 or 2011. He seemed to respond really well, and from that point on, every time I went to Mammoth, I'd check on him. When he was anywhere remotely close to me, we'd find a way to get him checked. As luck would have it, we both ended up in San Diego, so he is able to get checked consistently now. Q: What chiropractic protocols do you employ between / before / after races (in-office) to help Meb perform his best and avoid injury? A: I view the primary goal of any [chiropractic] adjustment as being the reduction of interference in the body. In the build-up phase leading up to races, that allows for maximum performance on race day. In recovery phase, it allows for optimum healing. I do use different tools at times, but it's based on what he (or any other patient) needs at that moment, not based on before or after a race. Q: Did you attend the Boston Marathon as Meb's DC? A: I did not attend the Boston Marathon. It would have been an amazing experience, to say the least! However, leading up to Boston, Meb had been training up in Mammoth. He had a red-eye flight from San Diego to Boston, and was driving back into town that afternoon. He asked me if there was any way I could meet him at his house – he had left himself just enough time to kiss his girls, pack his bags, and get adjusted. He went right from being adjusted to the airport! I have been with him at other races, and it's always chaotic because of media requests, obligations, etc. We usually end up in a cramped hotel room. I was with him in Houston in 2012 for the Olympic Trials. I checked him the evening before the race, which he of course ended up winning to go to the London Olympics [where he finished fourth, just off the medal stand]. It's become a routine now to get adjusted as close as possible to the race. Q: What are the most common running-specific injury patterns you see, and how does chiropractic help minimize / prevent those injuries? A: The most common injury I see is unexplained knee / hip / foot pain. These are often pains that have no real explanation, and [are] often slow in onset – something that has been slowly building. No trauma, no known injury. Chiropractic is amazingly effective with these situations, and can often resolve them quite well (depending on how long somebody has let it go). Q: Do you work with any other athletes? If so, what sports are they involved in, and what protocols do you utilize that might be different from treating a runner? A: I work with a number of athletes from a variety of sports. I work with jiu-jitsu athletes, ballet dancers, triathletes, and cyclists. I really don't feel like I do anything different with them than I do with runners. I may have to pay special attention to a couple of areas, but it really comes down to removing the interference so their bodies can recover and be ready to compete at their highest level. Jiu-jitsu involves a lot of grappling, so hands / wrists can be more involved. I also sometimes need to see [these athletes] more frequently because of the combative nature of the sport. Ballet dancers also have a lot of foot issues that are unique to them.